DT HiLoad Australia is the kind of company you get when you combine a commitment to excellence with more than 15 years of experience. The light weight, heavy duty trays they manufacture are used for mining and quarrying rear dump trucks and are able to withstand even the harshest operating conditions, while improving mine profitability at the same time. DT Australia is not content to rest on their laurels, however – according to Sales & Marketing Manager Steve Turner, they are continuously testing and perfecting their product, eager to prove to the mining industry just how much they can get out of their trucks. DT Australia is part of the Ausdrill Group of Companies and initiated from DTSA, located in Chile, South America. This is where their uniquely engineered and patented design originated from. DT Australia’s engineering designs, body enhancements and rich knowledge base are all continually evolving to suit their client’s mine-specific requirements. 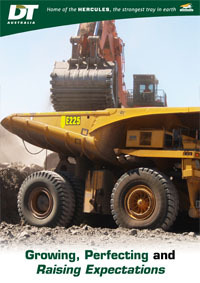 The dump truck body that DT Australia manufactures is called the ‘Hercules’, and is truly top-of-the-line. “It’s had about a 15 year evolution,” Turner says. “The concept was to establish a lighter weight body that increased payload.” DT did not realize that vision overnight – first they went through a succession of square bodies, trying to make them lighter. When they could not make that work they turned to a curve design, which Turner says gives the body inherent strength and capabilities that square bodies simply cannot. That design is the basis of the Hercules structure we see today. The Hercules body is flexible in construction, and allows trucks to realize their payload capacities in all material from coal to iron ore. The design also allows for it to be retrofitted to existing fleets as well as new truck models. For mines, utilising the Hercules body means greater productivity, safer hauling, and lowered operating costs. For DT HiLoad Australia, the challenge is to continually perfect and stay ahead of the competition. “There are always challenges in mining to become more efficient with productivity and safety,” Turner says, and towards that end they have full-time engineers who are continually doing new trials and tests, and analyzing ways to improve the product. Behind that growth would be the DT difference: focus. “Most other body manufactures are engineering companies that build not only their own bodies, but they build bodies for OEM’s (Original Equipment Manufacturers). They also build water trucks; they build buckets, et cetera.” DT is unique in that, to date, they have solely produced the Hercules tray and all of their research and development has gone into that product – that is why it is so far ahead of the pack as far as high-performance light weight bodies go. Another service that DT Australia provides that sets them apart is their fully dedicated and flexible service team. “We’re one of the only companies that offer dedicated service to their product,” Turner says. 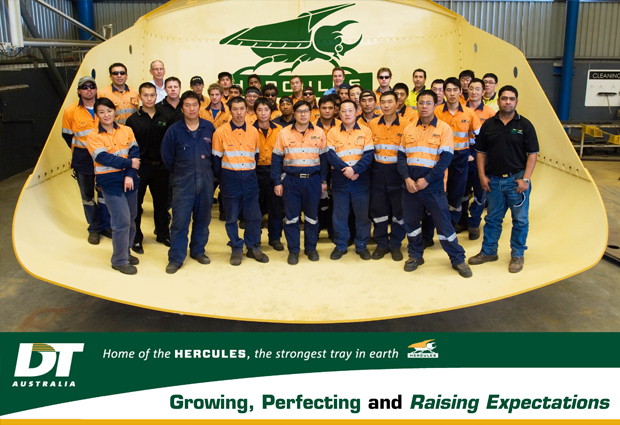 “With our company, the Hercules body is very much the product, so if we sell a body, and the mine chooses, we can look after it for them.” They also export, and Turner says they are achieving a high amount of success in exporting their trays both within Australia and abroad. “That’s a continually growing market for us,” he says. The future seems wide open to DT Australia, and they are currently measuring their options. In the meantime, they have invested internally, improving their manufacturing plant in Perth. There they have state-of-the-art plasma cutting equipment, welding equipment, and one of the largest rolling machines in the whole southern hemisphere. “We’ve investigated different ways of improving the business, becoming more efficient and improving productivity,” Turner says. As far as the next few years are concerned, Turner says there are plenty of plans in the works – it just depends on how they keep expanding. “Certainly product development is a key,” he reiterates. “We’re looking at initiatives in how we develop that product further. There are a few things on the drawing board. 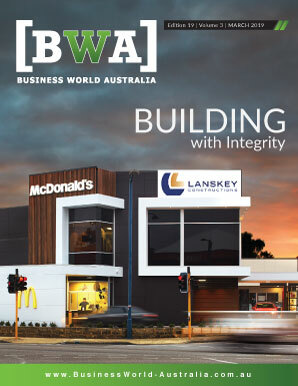 There are some exciting things happening for us in that regard.” And because of the amount of business the company is currently generating, they are considering expanding and establishing new facilities, both in Australia and around the world. “That’s a continually evolving process,” he says.